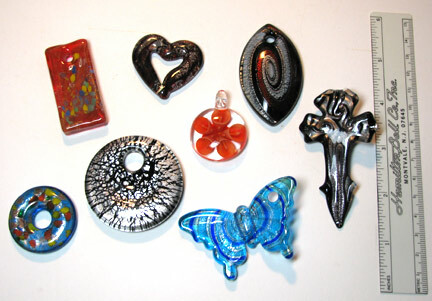 Beading Arts: And yet another Murano glass pendant giveaway! Thanks to Auntie's Beads, the next glass pendant giveaway starts today, just as the old contest ends! The next pendant on the block is the large cross on the right side (Murano Style Fancy Cross Pendant, Black With Silver/Gold Foil). All you need to do for a chance to win it is to leave me a comment telling me what you plan to use it for and you'll automatically be entered. If you tweet or post on Facebook or other social spots about the contest, you can leave a second comment and be entered twice! Please please please make sure that your link will lead me to an email address, or else I won't be able to contact you. No contact, no win, and I simply have to go on to the next person. Deadline: December 9, 2010. Check back next week for new chances to win! Murano Style Glass Pendant, Round With Orange Flower, 30mm. Murano Style Glass Heart Pendant, Brown With Silver Foil, 38mm. As regards FTC disclosure guidelines: I have received these glass pendants free of charge from Auntie's Beads in order to create some projects free of charge for you and to give away the rest. I have not been paid for my endorsement as it pertains to the products received. i would like to win this pendant! i would use it to make a gothic-looking necklace. I think it would be a pretty accent to a Renaissance purse. I would use it to make my daughter a beautiful necklace for Christmas. I love the black and silver disk that looks like a tree silhouette. I would use it to embellish a journal or pen wrap so a tie could fasten to it. They are all beautiful! Thanks for giveaway. I would use the pendant in a necklace with large black faceted beads. Big, Black & Bold! I'd love that pendant, it looks fantastic! The other beads are really cool too. awwww. I would love to win this. I love all of the pendant/beads. I would use the cross as the focal bead in a necklace. I would use smaller silver glass and onyx beads to enhance the beauty of the cross and make it stand out. Thanks for the opportunity to win this beautiful pendant. Jewelry By LUET And Co. I would use it to make a necklace or brooch for my MIL. I would use it as a focal point of a silver pearl and smokey crystal necklace. I would love to win this cross to make a necklace for my Mother. Thank You for the give aways. I would love to win this - I would tat a lovely necklace for it to hang on and then give it to my sister as a present. I would like to use this cross in a necklace for my best friend who does a lot of favors for me. She enjoys going to Renaissance Fairs and I can see her wearing this there. I haven't worked with murano glass yet but I love this pendant. I would love to add some faceted crystals and silk ribbons to it if I won. Beautiful- thanks. I would use it to adorn a plain black velvet ribbon to wear as a necklace. I would use the black pendant as a focal and dangle beads from it. It's a fantastic bead. I think I would crochet a chain to wear it. I suspect my sister would like it.